A Self-Help Guide--with Jazz Hands! Life is Like a Musical features 50 wry, witty tips on getting ahead in life and love--all learned in the showbiz trenches. 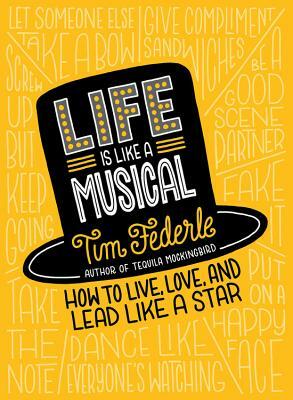 Before Tim Federle became a bestselling author and a Broadway playwright, he worked as a back-up dancer at the Super Bowl, a polar bear at Radio City, and a card-carrying chorus boy on Broadway. Life is Life a Musical features 50 tips learned backstage, onstage, and in between gigs, with chapters such as "Dance Like Everyone's Watching" and "Save the Drama for the Stage." This charming and clever guide will appeal to all ages and inspire readers to step into the lead role of their own life, even if they're not a recovering theater major. Tim Federle is a former Broadway dancer turned award-winning writer whose works include the bestselling cocktail recipe books Tequila Mockingbird and Gone With the Gin, the novels Better Nate Than Ever and The Great American Whatever (each named notable books of the year by the New York Times), and the Tony-nominated Broadway musical Tuck Everlasting. A native of San Francisco who grew up in Pittsburgh, Tim now divides his time between New York and the internet.